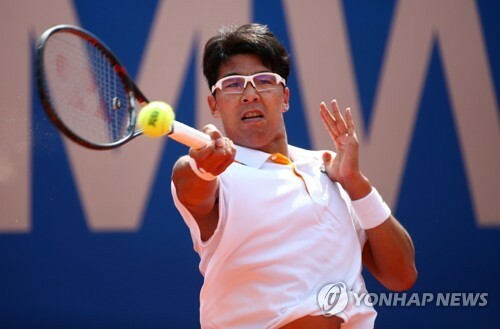 SEOUL, May 23 (Yonhap) — South Korean tennis player Chung Hyeon said Wednesday he will miss the French Open with an ankle injury. Chung, world No. 20, first announced his withdrawal from the Lyon Open in the French city o the same name earlier in the day, prior to his round-of-16 match against the 75th-ranked Gilles Simon. Then hours later, Chung also said he has pulled out of the French Open, the second Grand Slam tournament of the year, starting on May 27. Chung was supposed to have kicked off his clay court season at the Barcelona Open in April, but he missed that event with the ankle issue. At the French Open, Chung could have become the first South Korean to be seeded at a major tournament. Chung made a surprising run to the semifinals at the first Grand Slam event of the year, the Australian Open in January.